A gift to your cupcake for her cupcakes! 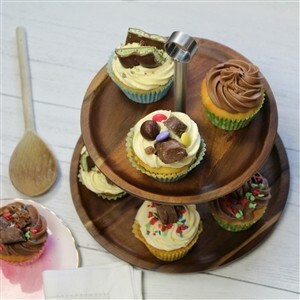 This wooden cake stand makes a beautiful addition to the afternoon tea table! Two tiered and made from acacia wood it features a nifty stainless steel carrying handle. It makes a lovely gift for your favourite cupcake artist! Of course the stand would also look great laden with fruit and grapes hanging over the top edge with crackers and cheese filling the bottom tray.... yum....! Please note, the tray will be sent to you flat for home assembly.